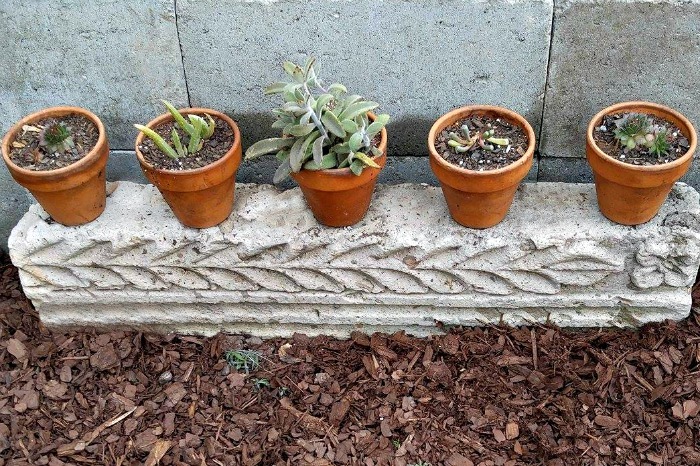 A few years ago, I used a group of cement blocks to make a corner planter for my succulents. I LIKED it but didn’t love it. It was more of a plant shelf than a planter and the succulents never quite gave it the look that I wanted. 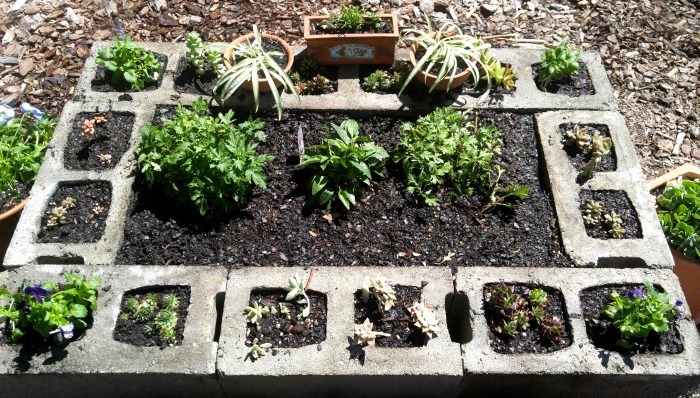 This past weekend, I took it all apart and started over again and this time, I am In LOVE with my Cement Blocks Raised Garden Bed. My new planter is a home for my hardy succulents, perennials and a few colorful annuals. 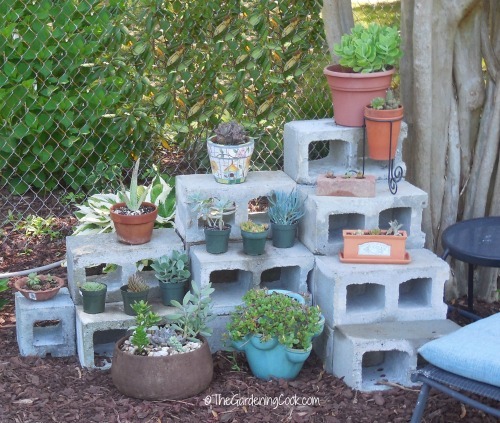 The planter uses 16 cement blocks and gives me a just about waist high planter that is easy to tend to and looks great in my garden bed. I have it staged with additional planters, a cement rectangular decorative piece to add interest, and I added some pansies and spider plants to soften the hard look of the succulents and cement blocks. This is the way the planter looked a few years ago. The main thing I did not like was all the holes on the front side. 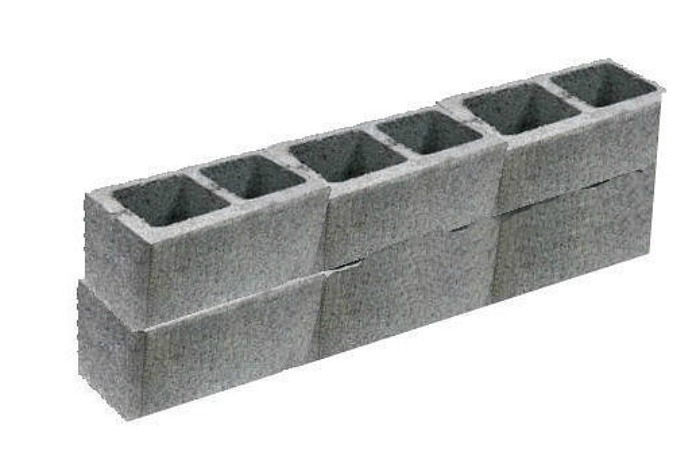 I had wanted shelving but those big holes in the cement blocks kept bugging me. The planter is basically a rectangle shape. We started with 2 rows of three blocks on the front. The sides have a single block in two rows and the back repeats the front section. 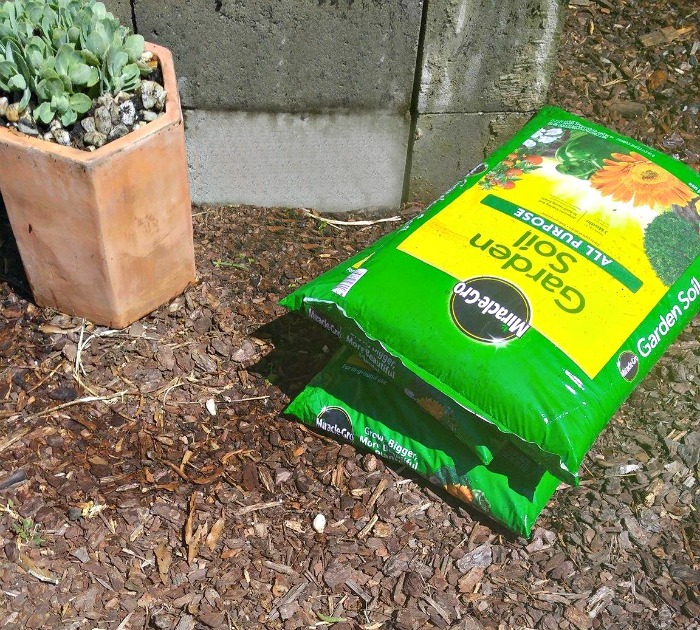 Once the cement blocks raised garden bed was constructed we filled it with normal earth on the bottom half and then better garden soil for the top half. A couple of these cement decorative pieces made it home one day with my husband. He is a trooper finding me things to use in my garden. I never know from one day to the next what he’ll be bringing home! I pulled one of them out to decorate the front of the raised bed. I placed this piece in front of the planter to use as a shelf for some clay pots planted with succulents. Planted left to right are some hens and chicks – sempervivum, aloe plant. kalanchoe tomentosa – Panda plant, living stones and more hens and chicks. The large center section of the raised bed got planted with two mum plants and a large cone flower plant. 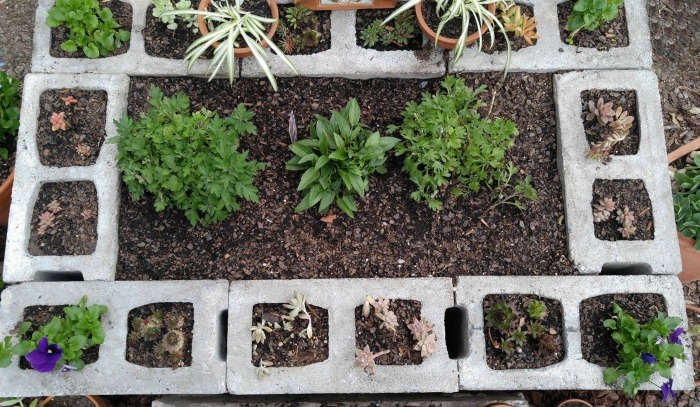 Pansies were planted in each corner block and then I put various succulents in the other holes in the blocks. 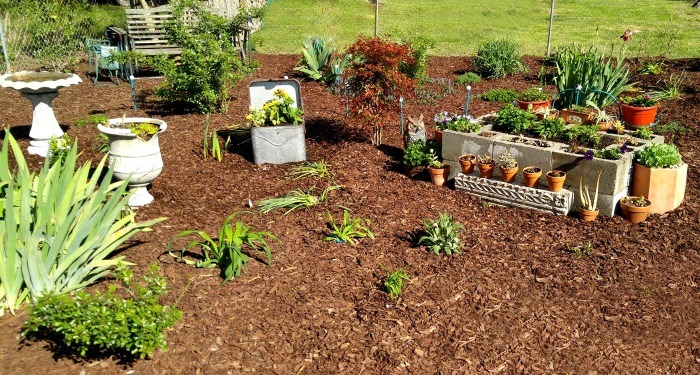 Both the left and right side of the raised garden bed is accented with large clay pot planters with succulents, more pansies and some cacti plants. A couple of spider plants in matching bowl clay planters and a small rectangular clay pot completed the look of the top of the planter. They also added a bit of height that the planter needed, and balanced the rectangular front decorative piece. 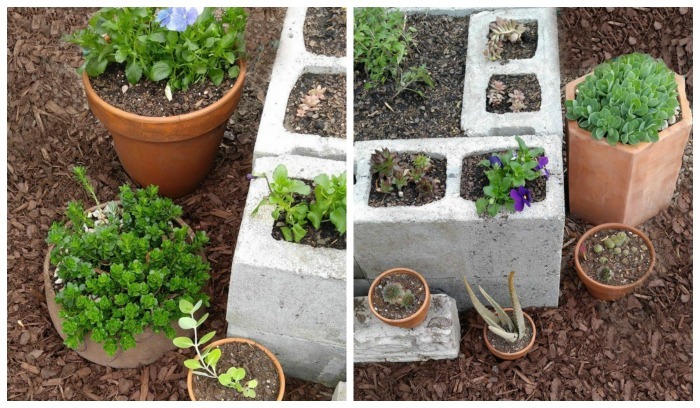 On the back side of the planter, I wanted to camouflage the plain cement block back so I placed a piece of limestone in the center and added my terracotta and blue planter that I made a couple of years ago to go along with my musical instrument planters. 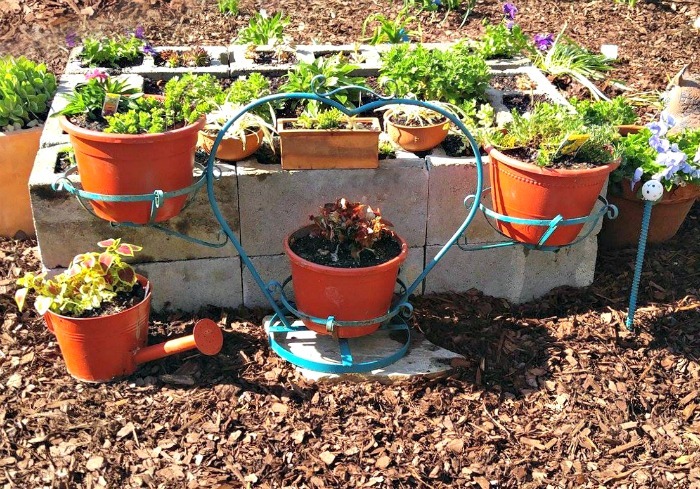 A brightly colored watering can planted with coleus plants completes the look of the back. The main reason my husband didn’t think he would like the cement blocks raised garden bed is because he thought it would look “too industrial.” But adding the annuals, the rectangular decorative piece and the extra spider plants and clay pots here and there softened the look of the whole thing nicely. Dark brown mulch softened the finished look, too. Once we had it all finished and planted, he loves the look as much as I do. I love the way the color of the planter coordinates with my urn planter, bird bath and galvanized tub planter. 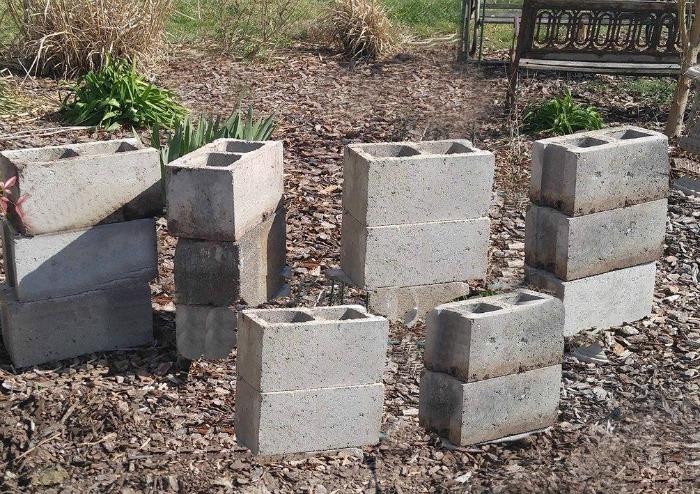 When the surrounding plants grow as the summer progresses, the cement block raised garden bed will add a stark contrast to the softness of daylilies, foxgloves, Sweet William, roses and Nandina shrubs. I can’t wait to see how it looks in a few months! Genius! This makes it seem idiot-proof which is exactly what I need. Living in Florida, with the heat and the soil, what type of veggies could be grown?